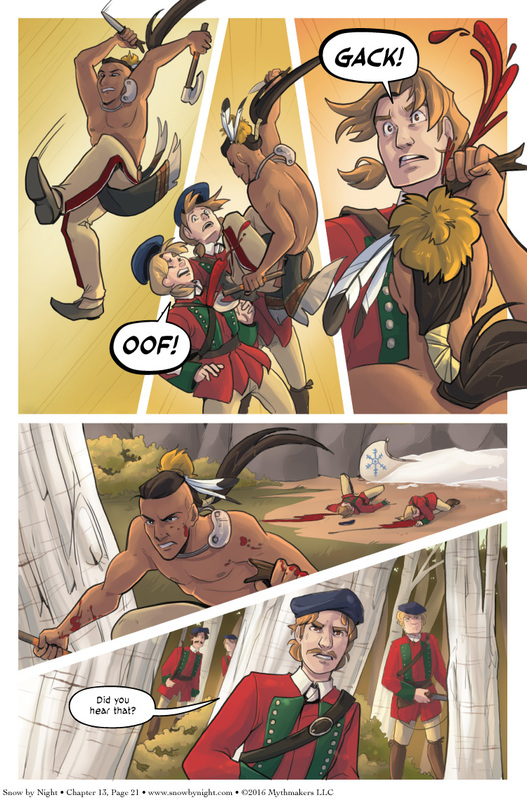 Defiant Elk leaps into action on Chapter 13 Page 21! Alas, there will be no snowball fight. See Snow-by-Night join the fight when you vote for Snow by Night on Top Web Comics. Julie, Steph, Diane, and I (Eric) will all be at GENCON next weekend! We love this convention. We’re huge gamers and there’s so much to do at GenCon. We’ll be in the Author’s Avenue at table AA-I. We’re also working on a special surprise with Erik Scott de Bie and Brian Cortijo for Candlekeep Presents on Saturday night. But you’ve got to attend that seminar to find out what it is! Poor guys who didn’t really do anything wrong except invade enemy territory. Guess this is the occupational hazard of being a soldier. And they didn’t even get one last snowball fight! Mmm . . . irony! Alas, poor scouts. We barely knew ye.